WTI crude prices remain in the $45.00/b-$45.50/b range this morning. 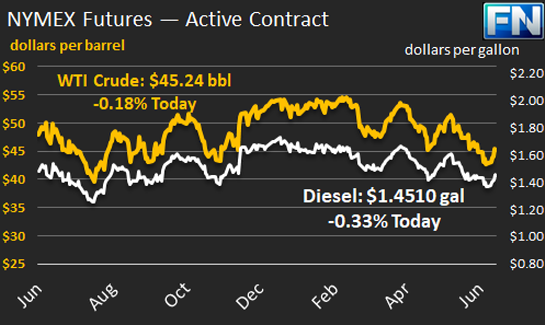 WTI prices remained stable yesterday, closing at $44.93/b yesterday, four cents up for the day. WTI opened at $44.89/b today, equivalent with yesterday’s opening price. Prices are $45.24/b currently, up by $0.31 from yesterday’s closing price. Diesel opened at $1.4467/gallon this morning. This was an increase of 0.72 cents (0.50%) above yesterday’s opening price. Current prices are $1.451/gallon, up by 0.50 cents from yesterday’s closing price. Gasoline opened at $1.488/gallon today, down by 0.42 cents, or 0.28%, from yesterday’s opening. Prices are $1.4891/gallon currently, up by 0.35 cents from yesterday’s close. 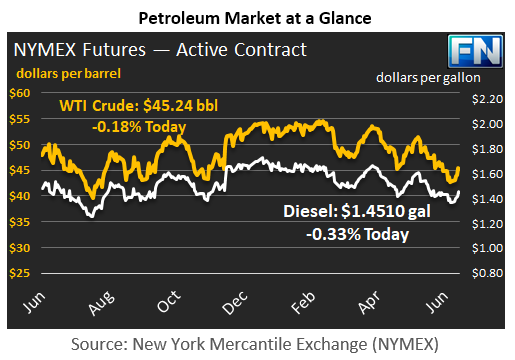 This week’s price rally broke a five-week downturn in oil prices, the longest downturn this year. Between the week ended May 26 and the week ended June 23, WTI crude prices dropped by $7.80/b. This week’s rally has recouped around $2/b of the loss. Although prices are seeking a higher equilibrium point this week—and may have found it at approximately $45/b—global oversupply continues to be the key issue in the market. Libya’s crude production reportedly rose to 935 kbpd this past week, up from 885 kbpd the week prior. Libya has announced plans to raise output to 1,100 kbpd in August. Nigeria hopes to raise its crude production to 2,000 kbpd in August, up from an average of 1,512 kbpd in the first quarter of 2017. Libya and Nigeria are not part of the OPEC-NOPEC production cut agreement. U.S. production growth, however, may be reaching a peak. According to the Energy Information Administration (EIA,) U.S. crude production dropped by 100 kbpd last week. This was the year’s most significant drop, bringing U.S. output down to 9,250 kbpd. Most of the drop was caused by Tropical Storm Cindy shutting in production, but output had been plateauing even before the storm. The market will watch today for the release of the Baker Hughes active rig count. Many analysts expect the rig count to continue upward, and some believe that it will take WTI prices of $40/b to stifle the U.S. industry. Upward price movement was reinforced Wednesday by the release of the Energy Information Administration’s (EIA’s) weekly supply data for the week ended June 23. The EIA reported a small crude stock build of 0.118 mmbbls, which was more than counterbalanced by drawdowns of 0.894 mmbbls of gasoline and 0.223 mmbbls of distillate. This fed a bullish sentiment, which overcame the API’s bearish prediction of an across-the-board stock build. A weak U.S. Dollar is also lending some support to oil prices. The Dollar index opened lower four days out of five this week, falling notably against the Euro and the Pound. During the week, the U.S. Dollar Index declined by 1.7%.